Who did I just free? Uhm, Cho'Gall, Teron Gorefiend (under the nom-de-guerre of Teron'gor), and Gul'dan. The Iron horde had made them their prisoner, and I freed them. My first act in passing through the Dark Portal into Draenor. Maybe I should have taken the side of the Iron Horde in this. Are Garrosh and Grom really worse than that trio? Oh, well. As Gul'dan says "there will be time for regrets later". From an Alliance point of view, I suppose it's all good. We get to kill orcs, either way. From an orcish point of view, there must be more ambivalence. Free Gul'dan? Really? At least Garrosh has saved the orcs of Draenor from drinking the blood of Mannoroth, The shattered planet that is Outland shows how badly that went! 10 levels in a day. I've just learnt that there are already 3 level 100 characters on my realm, less than 12 hours after the release of WoD. That's pretty poor work on the part of Blizzard, in my opinion. What in fact is the point in having 10 more levels if they can be skipped through in a day? I recall taking a year to get to level 50. I wonder if I'll even be able to stretch my 90-100 levelling experience out for a week. And once we get to level 100, what remains? Raiding, of course, but where is the virtual world we once lived in? Am I to play Garrison manager for the next couple of years? I already have a job like that in Earth Online. 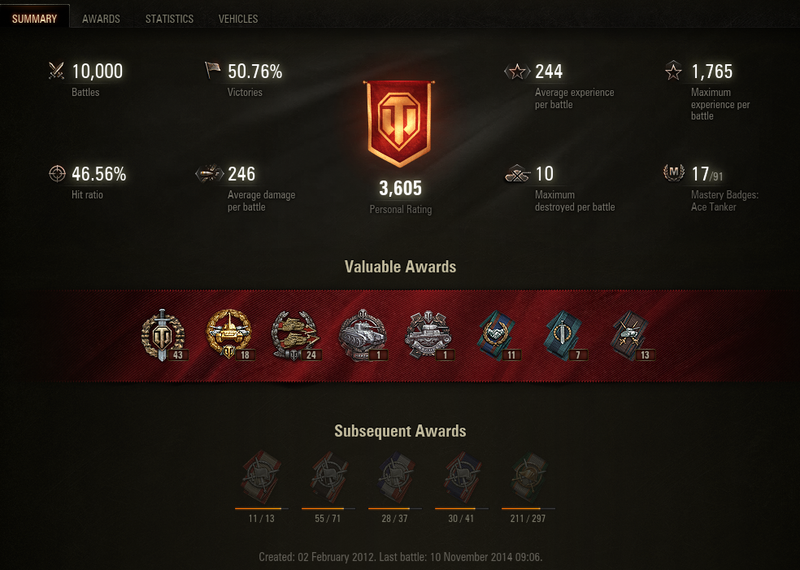 In World of Tanks, I passed a new milestone yesterday: 10,000 battles completed. And appropriately, my favourite tank, the Hetzer, fought and won the 10,000th. Go me! So what have I been doing for 10,000 battles? As you can see from my ratings, I'm a pretty average tanker. And I've mostly been using low tier tanks: there doesn't seem to be any advantage in advancing to higher tiers, as the tanks are much more expensive, and so is the ammo, and you can still be facing opponents two tiers above you. Well, up to tier 9, anyway, when only tier 10 is above you; and tier 10, where nobody is above you. Tier 5 or 6 tanks seem to be a sweet spot for earning credits (for non-premium tanks). In fact VBAddict shows that the top 10 tanks are all in those two tiers, so there really isn't much incentive to go into higher tiers where net income is lower, or even negative. It's taken me two years to understand what I should have been doing with my premium tanks. Every now and then, wargaming.net holds a World of Tanks event where the prize is a premium tank Premium tanks normally can only be got by spending real money to buy them. You buy an in-game currency called `gold` with real money, and then you can spend that gold on buying in-game items. Premiom tanks can only be bought with gold (not with the other in-game currency 'credits' that you can earn by playing the game), and so are often referred to as "gold tanks". I've won a fair few of them now. The latest such event was Togtober, and that would net you a British heavy TOG II* premium tank if you completed it. It was while I was trying to earn it, that a clan-mate happened to mention that there is no penalty for putting crew from similar tanks** in a premium tank. That's when it clicked. Once I realized this (two years is all it took), I knew at once that I should never give my premium tanks their own crew. I should always put crew from other tanks into them, because I can transfer them from their main tank to the premium and back again at no penalty: the premium tank becomes a training vehicle. I immediately kicked out all my premium crews, and put a bullet in the head of most of them. From now on, my TOG II* is dedicated to training my British heavy Black Prince crew. Sadly, most of my other premium tanks were light tanks, and I'm not really a fan of light tanks, except at tiers 1 and 2. So the next thing I did was to review the tech-trees for every nation to look at what premium tanks were suitable for training purposes. And of course, I came across the Russian tier 5 heavy tank, the Churchill III***. This tank was ideal for training the crews of my Russian heavies. It's rock solid. Slow moving, but hard to penetrate, and with a decent gun. It can stand toe-to-toe with most tier 5s. Then I took a look at American tanks, and bought a tier 5 heavy T14. I'm not so comfortable with this tank - my play-style doesn't suit it. It's more nimble than the Churchill, the gun is decent, but the armor is a little thin. Faced with a KV-1, it had better run! Now that I write this, it seems obvious that I should play it more like a medium tank. Anyway, the good news is that I now have three heavy premiums for the three nations that most of my heavies belong to. The German tree faces a disadvantage, though. Firstly, it has no tier 5 heavy premium tank. In fact its first premium heavy is the tier 8 Loewe. That doesn't concern me too much, though, because I prefer the German TDs. But there is no German tier 5 premium TD, either! The first is the Tier 6 Dicker Max. Tier 5 premiums cost 1500 gold (the currency that is paid for with euros or dollars). Tier 6 premiums are more than double that, at 3200g. So I'm going to hold off buying it until it's on special offer. Up until now, I've been spending gold only on garage slots and barracks bunks, since these (and gold tanks) are the only items you can't buy them with credits. All the so-called "gold" ammo (APCR and HEAT) that I have was actually bought with credits, not gold. But with the purchase of the Churchill 3 and the T14, I have officially gone pay-to-win. * I've no idea why the Tog II* has an asterisk in its name, either. ** No penalty, as long as the vehicles are the same kind. So Tank Destroyer crews can be moved to premium Tank Destroyers and suffer no penalty, but will suffer a penalty if moved to a premium Heavy Tank, for instance. And obviously, they have to be of the same nation.